The following is a list of some commonly used terms regarding watersheds. But first and foremost, let's define what a watershed is. 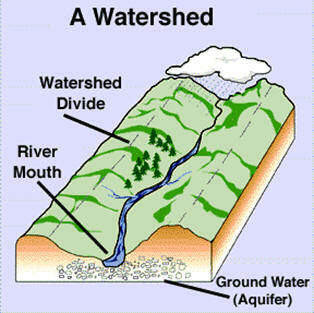 A watershed is an area of land where all precipitation that falls on it drains off and goes to the same place. The watershed acts as a funnel, collecting all water within the area and draining it into a common stream, pond, or river. Each watershed is separated topographically by a watershed divide, which is a geographical barrier such as a ridge, hill, or mountain. Aquifer - a geologic formation(s) that is water bearing. A geological formation or structure that stores and/or transmits water, such as to wells and springs. Use of the term is usually restricted to those water-bearing formations capable of yielding water in sufficient quantity to constitute a usable supply for multiple or varied uses such as drinking water, agriculture, or industry. Best Management Practice (BMP) – Effective and practical methods which prevent or reduce the movement of sediment, nutrients, pesticides and other pollutants from the land to surface or ground water, or which otherwise protect water quality from potential adverse effects of silvicultural activities. These practices are developed to achieve a balance between water quality protection and the production of wood crops within natural and economic limitations. Channelization – Any change to a stream that moves, straightens, shortens, or alters the current flow conditions of a stream. CWA Section 319 – Section of the Clean Water Act concerning nonpoint source pollution. The number is often used alone as either a noun or adjective to refer to some aspect of that section of the law, such as grants. 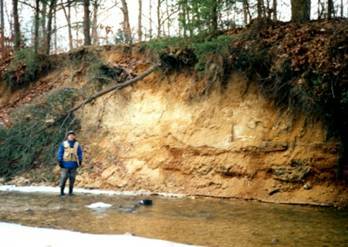 Erosion – The process where material is worn away by a stream, often due to the presence of abrasive particles in the stream or increased stream flow due to channelization. 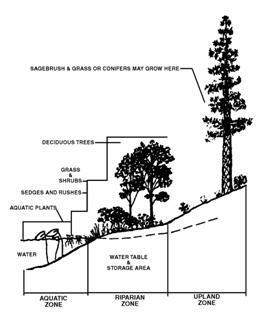 Erosion also occurs due to transport by wind or ice; by down-slope creep of soil and other material under the force of gravity; or by living organisms, such as burrowing animals. Flood Plain – a strip of relatively flat and normally dry land alongside a stream, river, or lake that is covered by water during a flood. Gage Height – the height of the water surface above the gage datum (zero point). Gage height is often used interchangeably with the more general term, stage, although gage height is more appropriate when used with a gage reading. Gauging station – a site on a stream, lake, reservoir or other body of water where observations and hydrologic data are obtained. The U.S. Geological Survey measures various hydrometry readings at gauging stations such as volumetric flow rate, water quality and observations of biota. Ground water - (1) water that flows or seeps downward and saturates soil or rock, supplying springs and wells. The upper surface of the saturate zone is called the water table. (2) Water stored underground in rock crevices and in the pores of geologic materials that make up the Earth's crust. Hydrologic Unit Code – The United States is divided and sub-divided into successively smaller hydrologic units, or watersheds, which are classified into four levels: regions, sub-regions, accounting units, and cataloging units. The hydrologic units are arranged within each other, from the smallest (cataloging units) to the largest (regions). Each hydrologic unit is identified by a unique hydrologic unit code (HUC) consisting of two to eight digits based on the four levels of classification in the hydrologic unit system. Maximum Contaminant Level (MCL) – the designation given by the U.S. Environmental Protection Agency (EPA) to water-quality standards promulgated under the Safe Drinking Water Act. The MCL is the greatest amount of a contaminant that can be present in drinking water without causing a risk to human health. Milligrams per Liter (mg/l) – a unit of the concentration of a constituent in water or wastewater. It represents 0.001 gram of a constituent in 1 liter of water. It is approximately equal to one part per million (PPM). Potable Water – water of a quality suitable for drinking. Riparian – Pertaining to the banks of a river, stream, or flowing water bodies as well as to plant and animal communities along such bodies of water. (1) Ephemeral Streams – Streams which flow only after precipitation events and are always above the water table. (2) Intermittent or Seasonal Streams – Streams which flow only at certain times of year when it receives water from springs, rainfall, or other source. (3) Perennial Streams – Streams which flow continuously. Surface Water – An open body of water such as a stream, lake, or reservoir that remains naturally exposed to the atmosphere. Total Maximum Daily Load (TMDL) – The calculation of the maximum amount of a pollutant that a waterbody can receive and still meet water quality standards. Also includes an allocation of the pollutant’s source. Tributary – A stream which joins another stream or body of water. 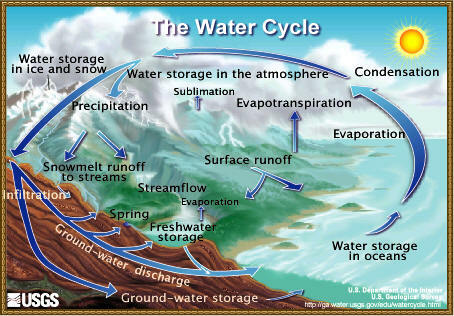 Water Cycle – The cycle that controls the distribution of earth’s water. Also called the Hydrologic Cycle. What is a 303(d) list of impaired waters?